My baby recently turned two! I can't say I was especially excited about it, she is growing too fast, and knowing she is my last makes every one of her firsts a last for me. This was true about her birthday too. I know by three she will definitely have an opinion on what kind of party she wants, so this was it, the last birthday theme I would get to choose. And what a hard choice it was. So many cute options out there: unicorns, hot air balloons, and every book themed party ever! Ultimately I had to choose something that fit her and was sweet at the same time. 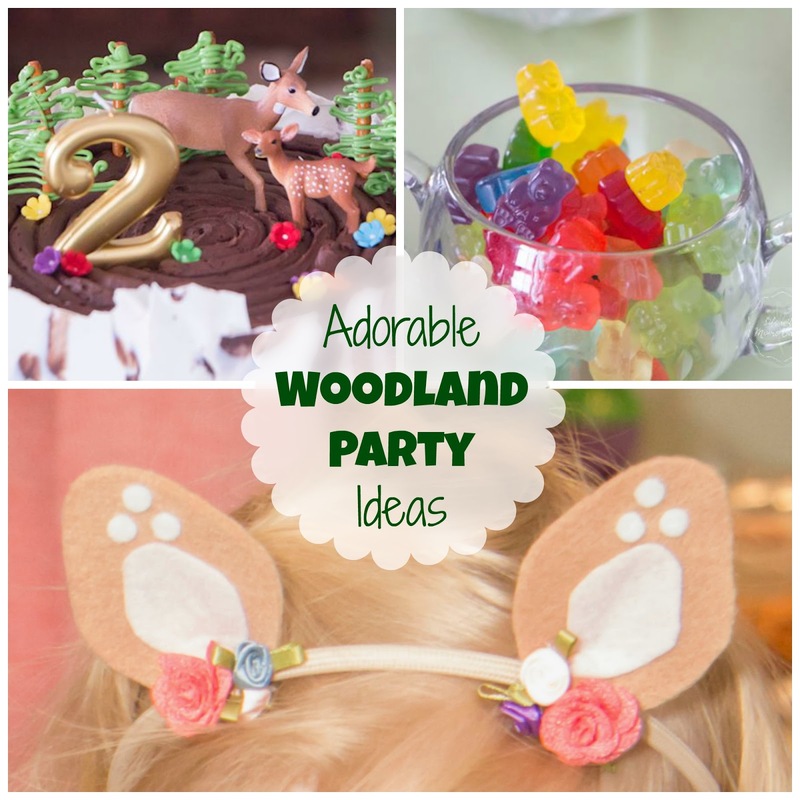 Since she is absolutely obsessed with her "squirrelly" (her lovey), and really just animals in general, I went with a woodland party theme. At first, I was worried that this wasn't really a girly themed party; I ran into that when planning her Rockin' Dino Party last year. Luckily I found these adorable and girly "Into TWO the Wild" Invites! 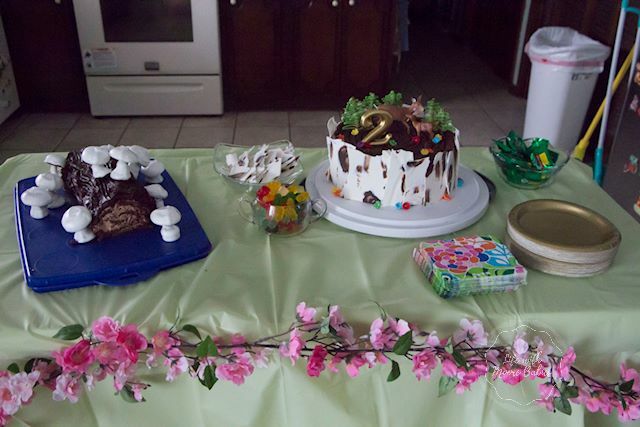 So, I kept the decorations super cheap, but they were very, very time consuming (so worth it though). My older kids and I cut up and painted a dozen egg cartons to create flowers. Yes, a dozen, 144 little flowers! I strung the flowers on fishing line and hung them from actual branches. I have to say that these are so pretty to me that they are still up, over a month later! I also raided my kid's overabundance of stuffed animals. I drug out anything that was remotely related to the forest and spread them around the house. Squirrels, rabbits, deer, we have them all. 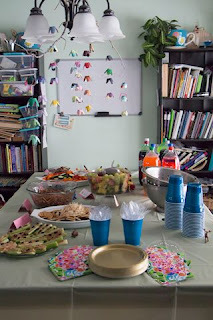 A pale green tablecloth was the perfect background for the very colorful, floral napkins my now two-year-old chose. Yes, she already had an opinion, and exerted it on the napkins! We pulled the gold and navy out of the invitations for the plates and cups. 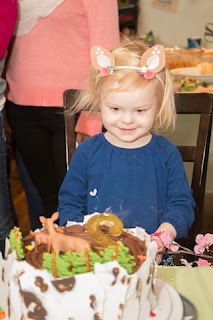 My daughter also wore an adorable deer headband that I made for her. 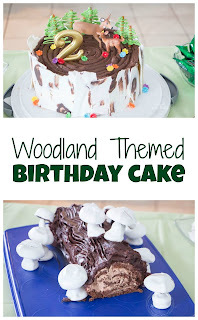 If there is interest in a post on how to make one let me know in the comments! This was one of the simplest cakes I have ever decorated which was very good considering my skill level in cake decorating. I got the idea of using bark around the outside HERE. It was seriously so easy! 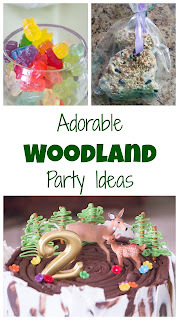 Brown icing tree rings on top along with a plastic deer, little pretzel trees, and simple sugar flowers. I also tried my hand at a Buche-de-noel; which may not have been the prettiest but was delicious! 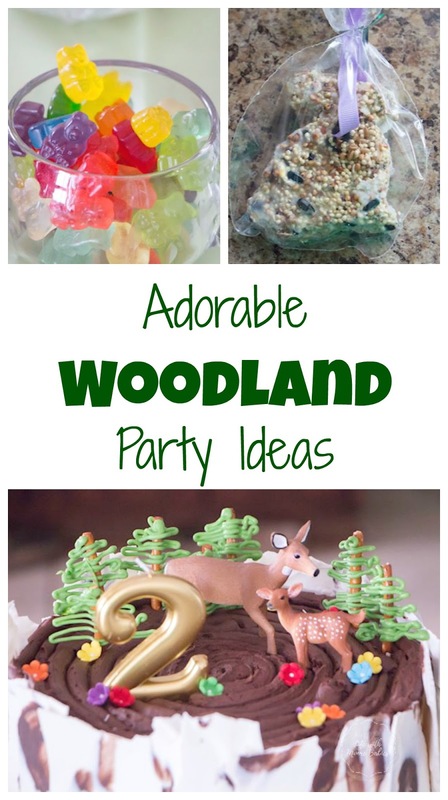 Colorful gummy bears were a must for a woodland party! 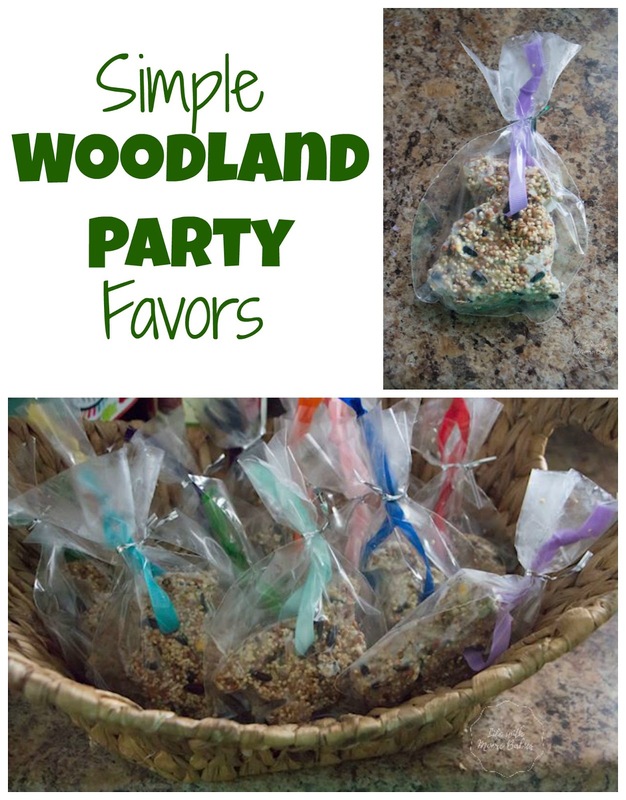 Ahhhh....party favors, I hate making a big deal out of party favor, and yet I feel obligated to still provide them. 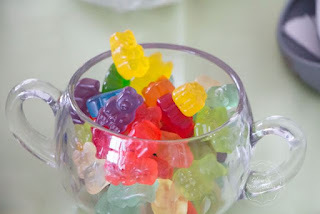 I always try to get away with cheap favors that are not just little annoying toys, you know the ones. For our woodland party, we made no-bake bird feeders. 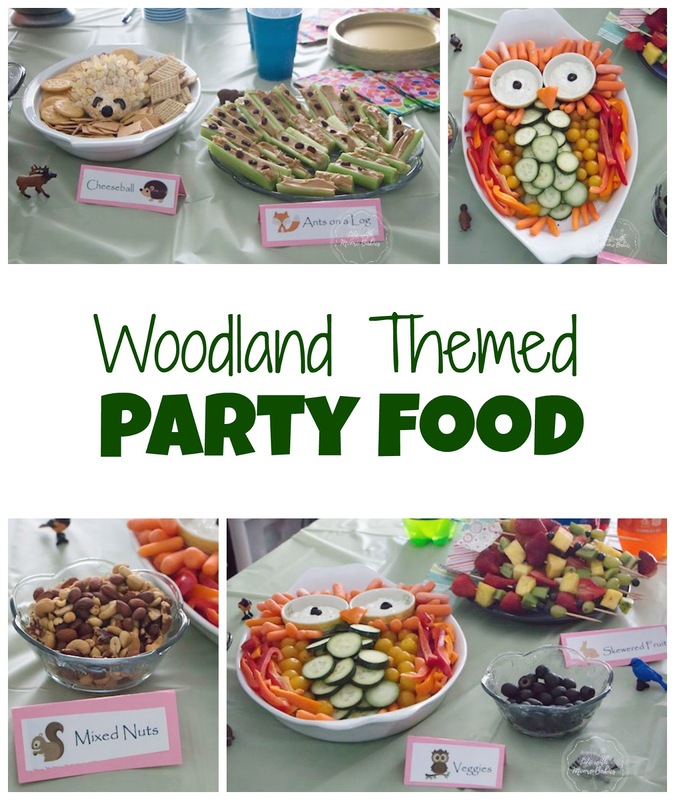 To get woodland friendly shapes we used cookie cutters in the shape of animals. We were able to make each of them unique too! We had some trouble with them falling apart when they were removed from the cookie cutter, but we just kept adding coconut oil until they stuck! Once they were hard we threaded a pretty ribbon through a hole we made with a straw. I am sure the birds loved them. At least I know ours disappeared pretty quick! ...or one of her favorite books at the time.